Every day, Hilltop faculty, board, and administration work tirelessly to change children’s lives by inspiring them to do better, be their best and work toward their fullest potential. Hilltop’s “Love of Learning” fund bridges the gap between expenses and tuition, covering extra items in the visual/performing arts, the authentic Montessori environments, science, and technology & global citizenship programming. Because of the “Love of Learning Fund”, our faculty will never have to dip into their own pockets for items that they wish to offer their students. Each year, hundreds of people including parents, grandparents, alumni parents and grandparents, current and former trustees, current and former faculty members, friends, corporations, foundations and matching gift programs contribute to the Hilltop Montessori Annual Fund program. Giving to the fund means that you believe in its purpose and believe in the mission of Hilltop. All donations to the “Love of Learning” Fund are tax deductible. Gifts of cash, checks, debit/credit cards, securities and matching gifts are available. Because of our tax-exempt status, donors are able to take a deduction as allowed by law. For more information about our “Love of Learning” Fund, contact our development office at 437-9343. 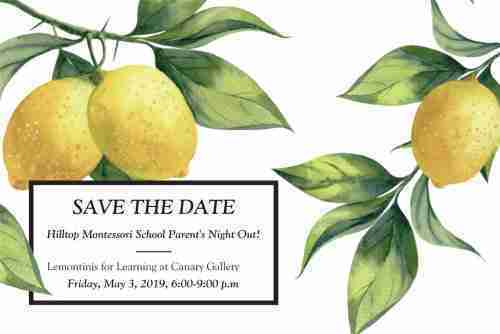 Also, SAVE THE DATE for our “Lemontinis for Learning” event at Canary Gallery on Friday, May 3rd!